No tent is built alike. At least, it certainly seems that way. 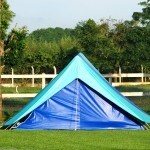 There are countless types of tents to choose from, each with its own unique features and functions. Choosing the right tent for your camp trip can become overwhelming, even for an experienced camper. Every camper has different needs, so having set requirements in mind when making your tent purchase will ensure that you buy the best one. Most likely you have a mental figure of how much you are planning to spend on a camping tent. Knowing even a rough figure will help you keep on budget. If you have never camped before, you may want to buy a less expensive tent to start out with; you can always upgrade to a better tent later. This way you won’t have spent an unnecessary amount of money if you decide that camping is not the hobby for you. Generally, the higher the price of a tent, the tent will be of higher quality, with stronger fabric and poles, and enforced stitching. While a cheap tent is a viable option for camping trips in mild and dry climates, a pricier, more durable tent is best for rougher conditions such as heavy rain and strong winds. Research different tent manufacturers before you make your purchase. Well-known brands are popular for a reason. If you are reaching your camping destination by car, the weight of your tent shouldn’t be a big issue. However, if you are backpacking, or if you know you will need to carry the tent for a lengthy distance, a light-weight tent may be the best option. How big does you tent need to be? How many people will be sharing one tent? When a tent is said to be made to fit a certain number of people (ie: four-man tent), this is the maximum amount of people the tent can hold. Oftentimes this tent ratio requires campers to sleep in extremely close company with no real space allowance for personal gear. If it’s possible, try to get a bigger tent; if there are two of you camping, vie for a four-man tent. There’s no reason to be needlessly cramped. Plan at least 30 – 32 square feet of floor space per person. If you’re not worried about reducing the weight, a tent with even more space would be great for longer camping trips. The length, height, and width of your tent will depend on your group size and the height of the individual campers. A camper whose height measures 6 feet will need at least another foot added t the length of the tent so that it is possible to stretch out while sleeping. The tent’s peak height should be a minimum of six or seven feet for an adult to stand in. As tents slope downwards at sharp angles, the amount of space in which you’ll be able to stand will be small. The higher the peak, the larger the space within the tent will be. Visualize at least two and a half feet in width between each sleeping camper, so you’re not crammed into your tent like sardines. For a further liveable situation, add in space for clothing and personal items and enough room to stand up without falling over your fellow tent-mate. Two adults can fit comfortably in a ten by ten foot tent with adequate stand-up room and space for air mattresses or cots. Any tent larger than ten by ten tend to be harder to pitch (it’s more difficult to find a smooth and level spot large enough to set up the tent). Plus, big tents can get pretty heavy. It may not be a big problem if you have a car, but it will still be quite a hassle to load and unload. A-Frame– The A-frame tent is supported by a pole in the middle; the tent walls drape over the pole to create an “A” shape. Umbrella– The umbrella tent is the most popular for family camp trips, with lots of standing room, large windows, and a rain fly over the top. Geodesic “Dome”– The geodesic tent is often free-standing, with two flexible structure poles intersecting at the tent’s peak. 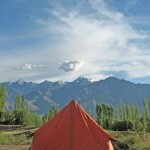 Wall- The wall tent is like an A-frame tent, but it is usually much larger and has vertical side walls. 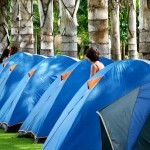 To learn more about the different styles of tents, read the article “Types of Camping Tents”. Sun and heat, cold, wind and rain all have different demands on a tent. Of course weather is unpredictable, so it would be near impossible to buy a tent based specifically on climate needs. However, knowing which features of the tent come in handy for what types of weather will help you be more prepared for what might come your way while camping. Sun and heat: hot weather increases the need for airflow and shade. Shade can be provided by the rain fly. Large screened windows/a screened door on opposite sides of the tent are needed so that air can flow through the tent. Cold: cold weather creates the need for a rain fly that fully covers the tent’s top and sides. The tent should also have an interior layer made from a mesh fabric which will allow water vapor to pass through it; otherwise the cool air will just condense on the warmer surface of your tent, making it damp. If you plan to camp in cold weather, you may want to consider a smaller tent. 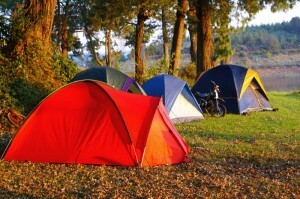 Your body heat can more easily heat a small tent than a large one. 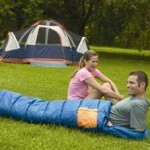 However, if you plan to use a tent heater, it would be best to have a larger tent. Heaters are not safe in small tents due to the closeness of the walls. Wind: windy areas require anchor ropes, stakes and sturdy poles. Because of their rounded shape, geodesic tents are excellent in wind, reducing the wind’s effect and providing great strength through their pole arrangement. Rain: it is important that your tent has a completely waterproof rain fly made of coated nylon. The fly should extend far enough over the door, so it keeps out the rain when you open the flap; the fly should also wrap around the tent and reach down the sides – nearly to the ground. Any rainwater that runs down and under your tent can be kept out by a “tub” floor. Tents with “tubs” have waterproofed coated nylon floors; the nylon fabric covers the entire floor, as well as up the walls’ sides for about six inches. A tent with as few seams as possible is recommended. If all this tent jargon has got your head spinning, check out the article “Camping Tent Features” for definitions on what makes up a camp tent. If you’d like to learn more the different types of tents available for campers, read the article “Types of Camping Tents”. Hopefully these pointers have been helpful. Keep them in mind when you go out looking for the perfect tent to suit your unique needs. Good Luck! No responses to "How to Choose a Camping Tent"